The history of Peru comes alive in the city of Cusco (spelled also as Cuzco or Qosqo, the politically most correct version). Cusco, at an altitude of 3300 meters, used to be the heart of the Inca empire - Qosqo meaning the navel of the world. The inca nation was called Tahuantinsuyu (or Tawantinsuyo), meaning the four corners of the world. And its current voice, Radio Tawantinsuyo, indeed reaches the four corners of the world. I picked up Radio Tawantinsuyo years ago on 6173 kHz, off the nominal frequency of 6175 kHz. Long ago the station used also 4910 kHz in the 60 meter band. Locally it is received on 91.3 FM and regionally on 1190 kHz AM. Radio Tawantinsuyo is located on Cusco's main street, Avenida del Sol 806, but mail can be sent to Casilla 39. On the street level there is a counter where listeners can leave their paid messages, mensajes, which is the main source of income for the station. A studio is located on the same level, while offices are upstairs. Radio Tawantinsuyo claims to be the most popular station in Cusco. It was founded in 1948. Station manager, Ing. Raúl Montesinos Espejo has been in charge throughout the years. Recently a book about his long career and the history of his station was published under the title Una Vida y un Rumbo. The office of Montesinos is covered by diplomas. Some of them are from Bolivia, where Montesinos began his broadcasting career in 1941 by founding Radio Rural in the city of Cochabamba. Today the same station is known as Radio Cultura (1090 kHz). The Cusco station was also began on mediumwaves under the name Radio Rural. Competition with Radio Cusco was fierce, but eventually there was room for both. In 1955 a shortwave transmitter was added, and in 1956 the station was officially renamed Radio Tawantinsuyo. Montesinos has always wanted to promote the indigenous culture of the heirs of the Inca nation. The format of Radio Tawantinsuyo - mostly traditional folk music (huaynos) - is an expression of this. In 1973 Montesinos initiated the creation of the flag of Tawantinsuyo, which today decorates the Plaza de Armas (central square of Cusco) along with the official Peruvian flag. Montesinos has founded and named after himself a museum of traditional local clothing. 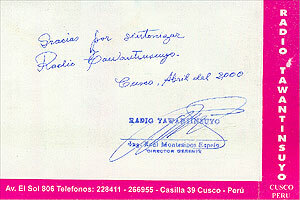 An item from the collection is featured on the Radio Tawantinsuyo folder used as a QSL. Montesinos is also involved in the most famous Cusco festival, the Inti Raymi (the Festival of the Sun), held annually on June 24th. That's when the day is shortest, and fires are lit to bring back the sun. Montesinos is happy that his station can be heard abroad - but he's not known for having much interest in verifying reception reports. At my request, I received verifications for myself and five other Finnish DXers (Jarmo Havukunnas, Markus Salonen, Jim Solatie, Ilkka Suni and Hannu Tikkanen).